While waiting till the petz grow to their full size may seem to be a good idea it is not necessarily so. The expenses taken may not be worth the outcome. In my opinion the best moment to sell a pet is usually when it is one or two levels below its maximum. Throughout the game, you can earn reputation by leading the pack during various exhibitions. If you happen to not be prepared for a specific exhibition, your opponents will gain points and you will fall behind, but it will most likely not be game-shattering. The exception to this is during Final Scoring. During Final Scoring, all negative exhibition points are deducted from your actual reputation. You will need to be at least partially responsible for keeping a positive score even if you do not expect to win these exhibitions. The Business Acumen Exhibition, in particular, penalizes you 2 points for every imp that is not on your home board by game’s end. This includes ones at the hospital, on the platform AND distant cousins that you never recruited to join the team from the progress board. In my first game, I forgot the rule about losing points and failed to bring my family up to its full size. Not only did I fail to score in that exhibition, but I suffered a loss of 8 points as well. This devastated my game, and removed me from contention. I have witnessed other players succumb to this same fate in later games also. Bottom Line: In a game dependent on choosing which resources to focus on and which to neglect, make sure that family always comes first! Make sure you have enough anti-magic on your cages. You can always throw imps at frenzing pets, but unless you happen to get the special magic armor artifact, anti-magic is the only thing that will keep your pets from mutating beyond this plane of reality. Both my first and second pet did this, on the day I was hoping to sell them. Simple enough, whenever possible take a meat eater over herbivores or omnivores. Carnivores are worth more when sold because meat rots faster than vegetables. Now if there aren’t any meat eaters available the next highest value are plant eaters. The lest valuable when sold are omnivores. Of course this is all in context to how old they are. Of course a max age omnivore is more valuable than an age 3 meat eater. It’s more important that you sell you pets on as many turns as possible than it is that you get a lot of gold for them. Rarely have I benefited from holding on to pets to let them grow some more, if I have a match, I sell them immediately! 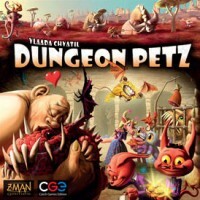 In Dungeon Petz this step-by-step learning is not needed, and you are presented with almost all of the rules for your first game, and then there are a few “full variants” given. Below are some thoughts on these variants, and whether I suggest you use them or not. Each color deck of need cards has a dominant need (red = angry, green = hunger, yellow = play, purple = magic), though only half of the cards show that need. The non-dominant need cards have two sets of icons when looking at the top and bottom of the card. The top shows a single symbol, while the bottom shows that symbol along with the dominant need of that deck. In the base rules, they advise ignoring the double symbols, and playing the card as you would normally expect. For the variant, you can play the card either way (to count as both, or just one). This allows for a bit more strategic planning. For instance, if you grab a creature with a lot of red cards expecting to build it up for a customer that wants angry pets, you could miss out if you happen to draw non-anger red cards. With this variant, you are guaranteed that all red cards will have anger, though they may have an additional need you have to deal with. I recommend playing with this variant from the start. It improves the game, and since the cards have either the single or double option, a player that doesn’t want to deal with two symbols can ignore that part. If you introduce this rule right before playing, everyone should be able to understand it fine. Do it! Allows you to reveal two customers and two exhibitions at the start of the game (or perhaps even all customers and exhibitions at the start of the game). I can take or leave this one. It makes the game more strategic, but it also has the tendancy to increase downtime, especially in the beginning rounds where the game should be moving quickly. This one I find group dependent. If you’re not prone to spending a lot of time analyzing a situation, go for it, but if it’s likely that people will really increase the game time because of this extra planning, pass on this one. This has to have been included primarily for the joke. Normally when animals aren’t purchased, they are removed from the game (supposedly sent to live on a farm), and unrelatedly, you add one meat to the food stand). In this variant, specific creatures lead to different things being put in the meat stand (Stareplant leaves vegetable instead, Baby Golem leaves gold, and Ghosty leaves nothing). I use this variant because I find it cute, and it really doesn’t impact the game very much. It’s good for a laugh, but is one more thing to remember, and it doesn’t come up all that often. In the end, all of the variants have a place, and if your group won’t be slowed down by them, you can give them all a try. The advanced food is easy to use or not, as is the double sided cards. I’d be careful with revealing all of the customers/exhibitions, and the final turn order seems like a good solution. I’d be happy to hear other thoughts on these over in the Discussion board!